I was talking to Jesse the other day about how I feel it’s time to cut back on the social calendar and snuggle in a bit and he laughed. “Well, it’s August 1st. You’re right on schedule.” I love summer. I love playing with the kids at the pool and spending time at Jesse’s family cabin. I love the warmth and the sunshine and the gazillion activities we get to choose from each and every day. But with August comes a natural lull for me. I’m not quite ready for summer to be over, but I’m starting to crave the structure and routine of the school year. I’m thinking about whether backpacks need to be replaced and what if any lunch box supplies should be purchased. I’m looking for deals on school supplies and uniform purchases. Jesse and I recently decided to move his home office upstairs and share the space while turning my old work space into a homework station so I’m deciding how I want to stock and organize that area. Speaking of organizing, I’ve been spending a lot of time thinking about home projects that I really should start to tackle. And since we are heading into fall and my first year fully unmedicated, I really need to start focusing on taking care of myself. 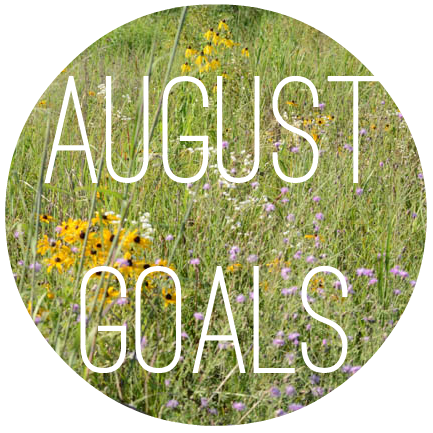 So anyway…all that to say I have some goals for the month of August. 1. Fully complete my checklist every day. 3. Rearrange the work area in the kitchen so it’s more of a homework station for Violet and Abram. 5. Finish my home projects plan. And off I go to make some chicken salad for dinner tomorrow!! What fun plans do you have for August? Ha! I wish there was some magic to it, but mostly it consisted of a poor diet (Monday and Wednesday were spent at the baseball field so there was popcorn and hot dogs for dinner), a blown dining budget (eating Tuesday and Thursday meals at the pool), and the generosity of Jesse’s family – most cabin meals are prepared by his parents and the rest of us just pitch in side dishes and desserts and snacks. The kids usually do toast or oatmeal or cereal for breakfast which they do for themselves (I’ve just been eating a bunch of almonds) and lunch is either sandwiches or another pool meal. It really is quite ridiculous.